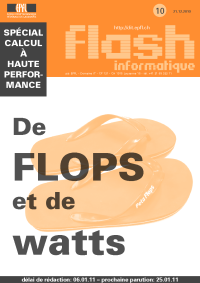 EPFL is dedicating this year’s last issue of its inhouse Flash Informatique to High Performance Computing. contributing to HPC going on at EPFL. In particular, several labs are working on energy efficiency of HPC hardware and infrastructure. An overview of the computing facilities available to researchers is also given.